At first I thought "wow, I knew babies cry but am I seriously such an ineffective mum?" but then my friends in the UK sent me this site http://purplecrying.info/ and I realized perhaps it's just a phase my baby is going through. He sort of has a routine of sleep, breastfeed, short period of contentment,and then cry. And then it begins again. Sure there are times during the day like right now when he is content for a bit. 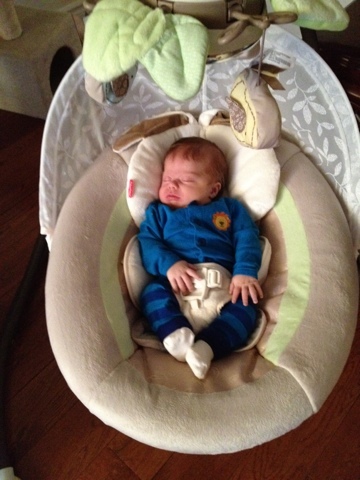 He is currently in his new Snugglebunny swing, and he can be soothed in it for at least 30 minutes. But then there are also days where nothing we do makes him happy. No amount of swaddling, swinging, shooshing, cooing, cuddling, breastfeeding, etc makes him happy. What has seemed to work is increasing his sleep time. I keep reminding myself he was born three weeks early so perhaps he needs a little more sleep. I am going to take him to a cranial osteopath this Friday in the hopes it will help. I can't travel in the car by myself. It's a two man job with one of us in the back seat soothing him and trying to comfort him. If we don't he screams to the point he pukes. Once we arrive somewhere, he is happy for a short while after he eats and then the fussies start again. He's gassy, and no amount of Ovol, gripe water or BioGia seems to help much. He hates the soother and rejects it. I am sure the gassiness is contributing to the fussies. We do a lot of tummy massage and movement to get him to pass gas. Man can this kid pass gas! He sounds like a 40 year old man. The pediatrician ruled out reflux, and says "he's just fussy. He will outgrow it." My motherly instincts tell me that something is bothering him - I just have to try and figure out what it is? Or it could just be purple crying- and he will outgrow it. In which case I will resign myself to being housebound until he is 4 months old.